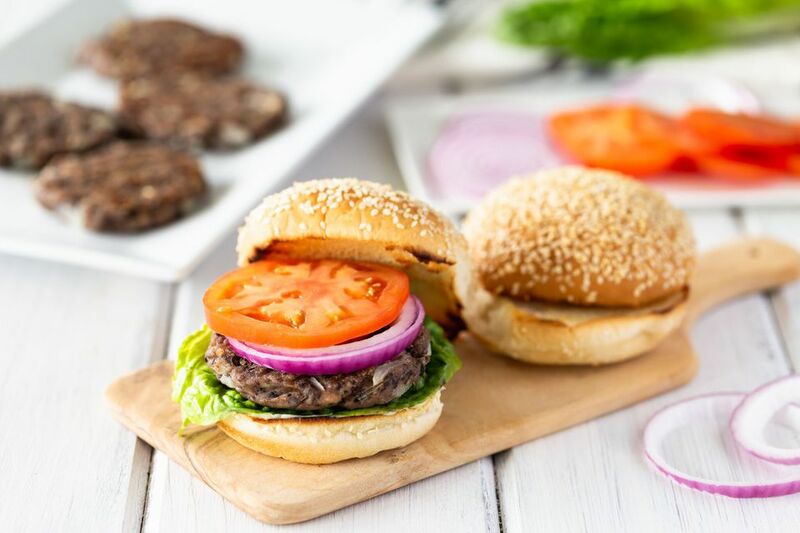 With just four ingredients and a few seasonings, you really won't find an easier (or tastier) vegetarian and vegan veggie burger recipe anywhere. You are likely to find yourself using this recipe over and over. These veggie burgers cook up quickly when pan-fried in a little oil, perfect for a quick weekday meal. But they aren't quite firm enough to toss on the backyard grill. This veggie burger recipe calls for no animal products, but it isn't gluten-free as it uses breadcrumbs and flour. Once you get the knack of making your own veggie burgers, you won't have to spend more money on frozen veggie burger patties. Plus, you have control over all of the ingredients. To a small frying pan over medium-high heat, add just enough oil to grease the bottom. Add the onions and sauté them until they are soft - about 3 to 5 minutes. Add the sautéed onions to the mashed black beans, along with the crumbled bread, seasoned salt, garlic powder, and onion powder, mixing to combine well. Add the flour a few tablespoons at a time and mix to combine well. Your veggie burger mixture will be very thick (you may want to use your hands to work the flour in well). Form the black bean mixture into individual patties, approximately 1/2-inch thick. The best way to do this is to roll a handful into a ball, then gently flatten it. Fry your black bean patties in a small amount of oil over medium-low heat until slightly firm and lightly browned on each side, about 3 minutes. If your pan is too hot, your bean burgers will brown too quickly and not be heated through and cooked in the middle, so adjust the heat as needed. To serve, assemble your veggie burgers and enjoy with all the fixings. Or, serve them on a plate to with a little ketchup or hot sauce and no bun. A nice green salad can round this out into a nutritious meal. One thing that makes this recipe quick is that it uses canned black beans. That's a big convenience. But you can start with dried for fresh beans and cook them until they are soft, as will be needed for mashing. The volume needed would be 1 2/3 cup cooked black beans. The seasoned salt makes a big difference in the flavor. Use your favorite seasoned salt or, if preferred, you can use regular salt.